Want a simple, light and resonant, superb-sounding dreadnought for sensible money? This is it! Sounds superb. Flawless build. Reasonably priced. We like the minimal looks. The standard D-15M (introduced in 2010), was the recipient of a rare Gold Award from Guitarist magazine. This new version is almost the same, with a solid 'genuine' (South American) mahogany top over A-Frame X bracing; the same material is used for the back, sides and neck. "The plain looks are very much in favour with cool people in modern bands, it seems, and while we're neither cool nor modern, we like 'em too!" There's no binding, the most minimal rosette, and that's it - save for the subtle brown 'burst finish. The plain looks are very much in favour with cool people in modern bands, it seems, and while we're neither cool nor modern, we like 'em too! Today's D-15M Burst differs from the D-15M we reviewed in 2010 in two main areas; first that the fingerboard and bridge are now morado, aka pau ferro or Bolivian rosewood, instead of East Indian rosewood. It's not a true dalbergia (rosewood), but it looks great, and if you can hear the difference, we'll eat our hat. The second change is that the neck joint is now a 'simple dovetail': a design phased in on all USA-made Martins that previously used a mortise and tenon. Rather than being a straight-sided, screwed-and-glued design, the simple dovetail is a more V-shaped, angled, sliding glued dovetail. It retains the threaded screw that holds neck and body together during the finish process, and differs from the higher-end, traditional dovetail in that it's CNC'd all the way, not hand-carved. Martin believes it to be a superior joint to the mortise and tenon, with improved vibration transfer. The D-15M Burst's neck profile remains the 'modified low oval', and it's hard to imagine anyone having a problem with it. Fairly slim, and just shy of 43mm across the nut, it's a super all-rounder, feeling slick and fast thanks to the satin finish and near-perfect setup. Bone nut and saddle: check. Vintage-style, open-gear tuners: check. Super-thin matt nitrocellulose finish all over: check. The lightly built D-15M Burst has a rich and projecting core sound that's complemented by the unmistakable, Martin D-resonance. It has a tighter, punchier midrange voice, with less complexity in both bass and treble than the spruce/rosewood dread' we had to hand for comparison. "It's vibrant and ebullient, yet not brash; warm and full without being thick or indistinct"
It's vibrant and ebullient, yet not brash; warm and full without being thick or indistinct. It sounds superb with the low E down to D for bluegrass-type flatpicking; equally so with knackered strings and a bit of analogue drive layered in any kind of contemporary rock or folk. This guitar is built and set up to an extremely high standard; super clean lines, excellent finishing and compelling playability. 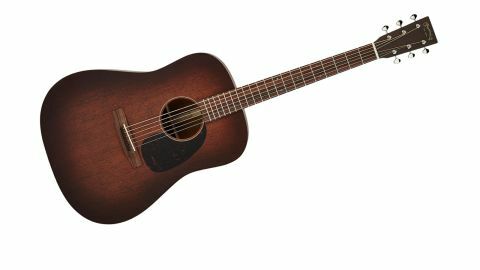 The D-15M puts every single cent of its build budget into making the best sounding and playing instrument, with very little concession to cosmetics, electronics or anything else. Solid woods, improved neck joint, bone nut and saddle, no frills whatsoever, save for the 'burst top: it's unreservedly recommended.